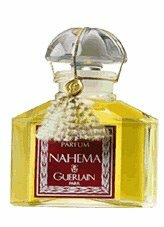 Jean-Paul Guerlain’s Nahéma parfum (1979) was unarguably one of the biggest, sexiest, most luxurious rose fragrances ever created. And one of the most terribly timed releases in perfume history. Its muse, the actress Catherine Deneuve, strangely was endorsing a competitor at the time of its release. Over the years, though, it has garnered its admirers. Years before Sophia Grojsman’s Paris and Trésor, Nahéma redeemed roses from a boudoir dripping in frillies. Much of this has to do with the amplification that JPG was able to effect in the execution of his idea. Other commentators – Luca Turin among them – have honed in on the painterly quality of this scent, and they aren’t unjustified in this. Damascones, the molecules isolated from rose oil by Firmenich in the late 70s, lent a golden, autumnal complexity to something that could quite easily have been frou frou. Alpha-damascones lent a ripe, bursting peachiness while beta-damascones bolstered the sandalwood in the base with a warm, dusky quality. All this, blended with Bulgarian rose otto and ylang ylang, succeeded in conjuring up the Arabian Nights sort of woman that Guerlain envisioned. Sadly, women at this time had their sights on the Far East and were more enamored of Opium-dreams than roseate visions. Nahéma deserves more serious reappraisal than it’s getting. The materials and craft of this fragrance are sans égal, and it doesn’t suffer from the additions and detractions of pervasive reformulation. It would be marvelous on a younger woman and is a shoe-in for the Insolence crowd. Other roses pale beside this- appearing sloppy, syrupy, maudlin , by comparison. Oh C., you lovely man, this is pure serendipity, because re-discovering (well, discovering really) Nahema is just what I've been doing! I have a sneaky feeling it's going to disappear as pure parfum at some point (*no* info on that, just seems to be a pattern). So although I don't do roses, I got a parfum tester on the B. Striking in all its permutations, but the parfum is divine!